After browsing listings and playing around with mortgage calculators, you’re ready to start putting your monthly housing payments towards a home you can actually call your own. But even if it seems like a better investment than paying rent each month, it’ll still require some significant financial planning. The mortgage application requires substantial financial documentation and your credit score needs to be within a range accepted by your lender. To top it all off, in most cases, you’re going to need a down payment to put towards the price of the house. But exactly how much do you need? Read on to find out. 1 What is a down payment on a mortgage? 2 Do you need a 20% down payment to buy a house? 4 What other costs are associated with buying a home? What is a down payment on a mortgage? A mortgage is a loan used to purchase a house. But there are very few mortgages available that will cover the full cost of the home. Instead, most lenders require that you pay a percentage of the home’s purchase price and finance the rest with a loan. The amount you pay is called a down payment. This provides the lender with the assurance that you are vested in the property. Otherwise, you may be more likely to default on the mortgage because you didn’t spend any of your own money on the house. While most people won’t miss payments and go into foreclosure, banks make this an across-the-board requirement. Do you need a 20% down payment to buy a house? Traditionally, banks required individuals to have a 20% down payment on their house in order to qualify for a loan. But it wound up making home ownership extremely exclusionary. After all, that amounts to $40,000 on a $200,000 and most people don’t have that kind of money lying around. While 20% remains the standard down payment conthat’s preferred by most lenders, it’s no longer the norm. In fact, data shows that the average down payment amount is shrinking due to young first-time home buyers. 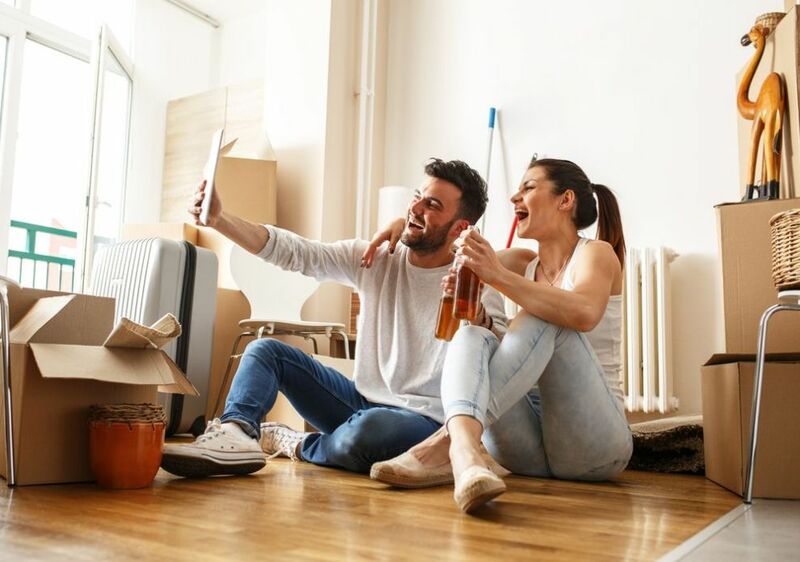 But there are some benefits to saving up that 20% before purchasing your home and they can add up to some pretty significant savings over time. Even beyond financial reasons, putting in an offer letter with a 20% down payment with a conventional loan can make you a more attractive buyer when you’re competing for a specific house. Why? Your loan looks less likely to fall through because you have a stronger cash flow and assets compared to someone with a low down payment. All other things equal, your offer will probably be selected in a competitive market. Another major perk of the standard down payment? You avoid paying private mortgage insurance (PMI). Any mortgage for a home you own with less than 20% equity is subject to additional insurance to protect the bank. The amount depends on your loan type but it’s usually an annual amount that is divided out as part of your monthly payments. To get rid of the mortgage insurance, you usually have to refinance the loan, which can be costly. You also get a better interest rate with a larger down payment. On top of that, having a smaller loan amount lowers your mortgage payment, giving you more money left in your pocket each month. Most lenders these days don’t expect you to have a full 20% down payment saved up. The exact amount you’ll need varies based on a number of factors. But most importantly, it depends on the type of loan you choose. Here’s a rundown of the most common types of mortgage loans and the down payment requirements for each one. Start here to begin your selection process. It’s also smart to ask potential lenders to provide different scenarios for each loan type you qualify for. Even if you don’t have a 20% down payment, you can qualify for a conventional loan. The minimum down payment is 3%, although you can also do any amount higher than that. On a $200,000 home, you would pay $6,000 with the minimum down payment. Up until a few years ago, at least a 5% down payment was required. However, Fannie Mae studies indicated that saving up that much money was creating an obstacle to homeownership for many creditworthy individuals. So they created a 97% loan-to-value option that lenders can offer to mortgage applicants. 2% may not seem like a huge difference, but it adds up quickly when dealing with such large dollar amounts. In the scenario above, a 5% down payment on the same house would require a $10,000 down payment — $4,000 more than the 3% option. To qualify for a conventional loan, you’ll need to meet certain lender requirements, which can be strict compared to other loan types. Credit score requirements generally start around 620, although some lenders may accept as low as 580. You’ll receive a higher interest rate with both a lower credit score and a small down payment, another factor in determining how much to save for your home. Of course, as with any down payment under 20%, your loan will be subject to private mortgage insurance. The exact rate can vary, but here’s an example of how much it could cost you. If your loan amount is $194,000 (after your 3% down payment) and your annual PMI rate is 0.5%, you’d have to pay $970 each year. Split up over 12 monthly mortgage payments, your PMI would add just over $80 to your bill. An FHA loan is another option for a loan with a low down payment. FHA loans are backed by the federal government and allows you to qualify for a mortgage without as many restrictions as a conventional loan. With an FHA loan, you only need a 3.5% down payment. On that same $200,000 house, you’d only need to supply $7,000 in upfront cash. You also get to take advantage of lower credit score requirements, with the minimum at only 580. Plus, you can qualify with a higher debt-to-income ratio. Conventional lenders only allow 43% of your monthly income to go towards debt payments, including your mortgage. An FHA lender, on the other hand, might let that number creep up between 45% and 50%. This is another example of a couple of percentage points making a difference in how much home you can afford. Again, lower mortgage application standards, including a smaller down payment, typically result in higher costs elsewhere. You’re likely to see higher interest rates and a higher PMI. With an FHA loan, you’ll actually have to pay that PMI in two different ways. The first is a one-time payment at closing. This amounts to 1.75% of your loan amount. Again, say that you’re taking out a $190,000 loan; part of your closing costs would include a $3,325 PMI payment. On top of that, you’ll pay about 0.85% annually. In this example, that amounts to $1,615, adding $134 to your monthly mortgage payment. Clearly, making a low down payment can cost you when it comes to paying private mortgage insurance each month! Still, it may be a better option, especially if you can quickly reach a 20% loan-to-value and refinance the loan in a few years. If you’re a military veteran or active member of the military, you can qualify for a loan backed by the VA. The great thing about this type of loan is that it doesn’t require any down payment at all. It also has lower credit score requirements. Another perk? No mortgage insurance. You do, however, have to pay a one-time funding fee. It can either be paid at closing or rolled into your mortgage amount. The fee amount varies depending on a few different factors, including your down payment amount, your type of service, and whether or not you’ve used a VA loan in the past. But if you’re regular military personnel and a first time user of the VA loan with a zero dollar down payment, your funding fee will total 2.15% of the loan amount. For the sake of comparison, let’s look at the $190,000 loan again. In this scenario, your funding fee comes to $4,085. Since it’s just a one-time fee, the impact on your monthly payment would be fairly minimal since it’s spread out over 30 years. A USDA loan is backed by the U.S. Department of Agriculture and promotes home ownership in rural areas. But you don’t have to buy a farm to qualify for this loan type; in fact, many peripheral suburban areas are included. The great thing is that there is no down payment required for a USDA loan. You do, however, have to meet certain income requirements and may only earn a certain amount each year, which varies depending on where you live. Like VA loans, USDA loans don’t require PMI, but you do have to pay an upfront premium if your down payment is less than 20%. The premium amount is 2% of your loan amount. That would be $3,800 on a $190,000 loan. Again, you can either pay it upfront as part of your closing costs or roll it into your mortgage amount. Check out the eligibility map to see if any properties near you qualify for a USDA loan. Our final low down payment loan is the HomeReady loan, which helps potential homeowners in low-income areas to get the financing they need for a mortgage. The required down payment is just 3% and your debt-to-income ratio can be as high as 50%. There’s no income limit, but the property does have to be located in a low-income census tract. You also have to complete an online education program about home ownership. While you do need to pay mortgage insurance with the minimum down payment, the program does claim to offer lower premiums compared to other loans. If you find a home you love in an approved area, it’s definitely worth comparing the HomeReady loan with other available options. What other costs are associated with buying a home? We’ve talked a lot about private mortgage insurance adding to the total cost of your loan. But it’s also important to remember that there are fees and expenses to consider. Some you’ll have to pay upfront, while others are paid over the course of the loan. First, remember that your monthly payment not only includes principal and interest but also taxes and insurance. Cumulatively, this is called PITI (principal, interest, taxes, and insurance) and those add-ons are often overlooked when using a mortgage calculator. City or county taxes are owed every year, but most lenders charge you monthly and then make the payment on your behalf. Homeowner’s insurance is also required for a loan, and can easily tack on an extra $300 to $1,000 per year, depending on the value of your home. You should also take closing costs into consideration. Many buyers may try to negotiate that the seller covers these costs, but this tactic isn’t always successful, particularly in competitive real estate markets. Closing costs cover a variety of services and fees and usually amount to 3-5% of the home’s purchase price. On that $200,000 home, you could end up paying between $6,000 and $10,000 in closing costs. If you don’t have the cash upfront, you can usually roll them into the loan, but you’ll end up with higher monthly payments. Don’t be afraid of closing costs, or any other fees associated with a mortgage, especially if you don’t have much saved for a down payment. Homeownership can often be a worthwhile investment and an enjoyable one! Educate yourself and run different down payment scenarios to pick the best one for your budget. We've researched the best mortgage lenders for any type of credit.